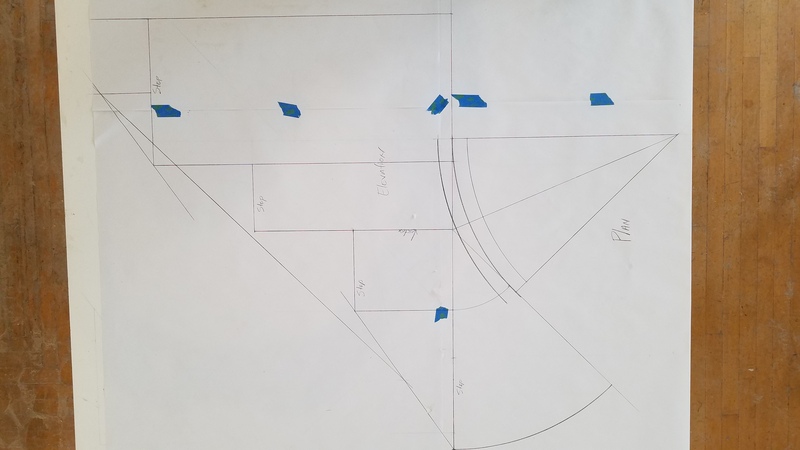 I'm making my first drawing for a face mold of an obtuse fitting. I completed the plan and elevation. I'd appreciate any input to make sure I'm on the right track. Perhaps you might include a stair, floor plan along with some dimensions? Your unfolded tangent-lines in elevation, don't seem to coincide with the pitch of the handrails above and below. This is OK as long as you plan to ease into the rails. This may be possible but usually not desirable. The idea, is to place the developed tangents, in-line or in close harmony with handrail pitch requirements. This drawing, known as a "tangent unfoldment," is the first required drawing after the plan. The arraignment of tangents in elevation, predicates the face mold diagram selection. Don't get frustrated, you'll get it! Here's my first attempt with cad. On this particular stair the contractor has set the newels and the handrail height is at 341/2". I adjusted the rail heights to try and bring the rails into alignment, but in this particular situation I don't see any way around using easements. Do you have any other suggestions for this particular railing? Also, if I were designing this new and using this unfoldment, how do I determine which tangent rail I should use? I'm unable to open your file. Perhaps you could just post it. I don't know why? Your question about designing stairs to accommodate a particular tangent arraignment, is a good one. Just unfold your plan tangents at the vertex. Include the straight, handrail pitches above and below the turn, in your elevation drawing. Extend those into the plan tangents. Drawn tangents that coincide with the straight pitches. You may change pitch only at the vertex. Ideally, a straight pitched line, running through the tangents of the curved section and coinciding with the pitch of the straight handrails, will yield the best looking wreath. You can vary the unit rise and run and place the plan risers anywhere along its' length. As long as the unfolded tangents and rail pitch, form a straight line or a single pitch change at a vertex, you'll b e able to form the handrail from a single, inclined, plane. Few folks or architects, understand any of this anymore and current stair construction suffers and handrails often appear crippled even in their best work. You are well on your way of possessing more information than most. Let me know if any of this makes sense. It makes sense that if a pitch change is necessary the best place to conceal it would be at the vertex by manipulating the your treads and risers. Some drawings opened-up but then refused to re-open. Try copying them to your documents and then just posting them here. It looks like your tangent unfoldment is producing a straight line at the turn but required easements in the straight sections, above and below? In order to maintain uniform handrail heights? Remember we have four inches of building-code leeway and sometimes varying the installed heights, is preferable to easements. It's your call. I can't re-draw your plan since you haven't furnished any dimensions. I accidentally erased your original email. Still it looks like you're on the right track. Isn't CAD great? Wait until you start drawing elliptic curves. BTW, To any other readers...Don't hesitate to participate or comment. I don't know everything and don't mind teaching others or being taught. .dwg files do not open unless you have the software to handle them. Better to convert to a .jpg, gif, or even a .pdf so anyone can see the files. try the preview before posting to se if they make it or not. No Greek but only a bit of 19th century American woodworking with a dash of British influence. 19th Century craftsmen figured-out how to draw patterns (face molds,) which allowed them to supply solid, spiral handrails for curved and geometric stairs. They did this, because it was easier than sawing perfectly sound timber into strips of bendable stock. They also lacked power tools, clamps, modern adhesives and other paraphernalia necessary for strip-lamination. The methods however, were and remain, perfectly sound. but perhaps, less competitive, especially when compared to modern CNC equipment. The knowledge of tangent handrail, is still a good thing to know, as I've already mentioned. 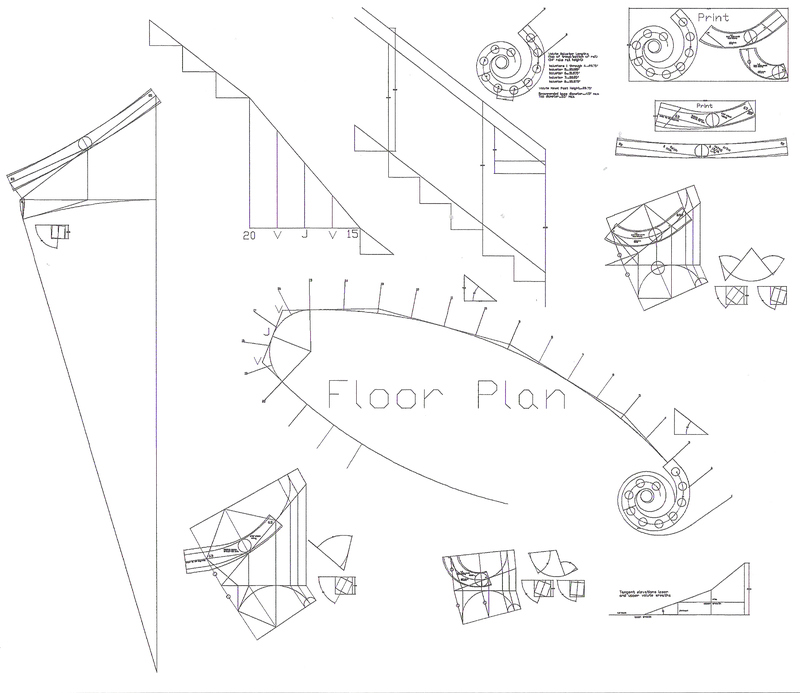 As an example, here is a complete set of drawings for a curved stair which makes a u-turn to a balcony. Most books focus on disembodied parts only. These drawings required a full-day of thought and drafting but after that, all components were fabricated from this plan. Nothing was fit to forms or assembled, other than the volute. The methods are from the Mowat's. As you can see, working without CAD would spread this out across half your shop, but here everything fits. The face-molds are the only things printed for the shop. If you have methods for shaping spiral handrail and parts, or are particularly adept at hand carving, then this may still be good for you. Otherwise stay focused on your CNC.